Got fond blindfold-bound memories of the IF 2008 Lights Out Dinner series? Then you might be interested in the food-and-fun exploits of Jo Self, a Louisville entrepreneur who calls herself the Bon Vivant Savant. Self has been staging meet-ups and themed dinners around town for the past couple of years, and an upcoming BVS dinner may have some special appeal for diners who enjoyed the IF blindfold experiences last year at Asiatique, the Mayan Cafe, and the Patron. On Monday, May 18, BVS is offering a dinner that places Miracle Fruit at center stage. Miracle Fruit is a berry with taste-altering properties. Chew one for a couple of minutes, and for the next hour everything else you taste takes on Alice in Wonderland dimensions. What’s supposed to be sweet is sour, what’s supposed to be sour is sweet, icy’s hot, and fiery lacks all heat. It’s a first for Louisville, and promises to push the town a little further out into the foodie frontier. You can make reservations at the Bon Vivant Savant's website, at the link above. It may be premature to make any grand conclusions only two dinners into the IdeaFestival Lights Out series, so let’s just call this an early observation: some people seem to get a charge out of ceding a level of control over their lives. How else to explain the high-decibel hubbub, laughter and smiles at the Mayan Cafe on Louisville’s East Market Street Wednesday night (June 14)? Forced to don blindfolds, and provided no menus or choices among the dishes and drinks they consumed over the course of three hours, nearly all the 50 guests nonetheless seemed unperturbed, unburdened. Some were downright giddy. Where were you when the green revolution stalled? So here I am thinking my IdeaFestival blogger gig is one of the slackiest of slacker positions to be had in the online world when Wayne Hall emails a request that I, as a blogger on food issues, identify the causes of the world food crisis. In a single post? I’m not sure that’s possible. And I’m certain it wouldn’t be readable. There’s so much being written about this phenomenon, and so many competing causes being identified, how could I possibly sift through and identify the most likely culprits? With the help of two of any writer’s best friends, of course: simplifying anecdote, and the New York Times. He’s one of five goats born on my central Kentucky farm about a month ago. I wouldn’t want him to hear this, but he’s not the cutest of the lot. That distinction belongs to Luna, one of the females. 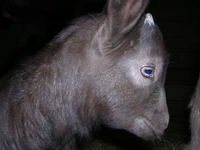 She’s petite, light brown with silky sprays of white on her flanks, and erect ears that make her look like a tiny donkey. She’s my daughter’s pet. Truth is, they’re all pets, the two mother goats included. My family has the luxury of keeping goats on our eleven acres just because we want to. We don’t need the milk the mothers produce and, honestly, would probably be more than a little appalled to try drinking it. That’s how insulated we are from the rougher edges of rural living. A log of fresh goat cheese—from nearby Capriole farm perhaps—nicely sealed in plastic? Sure! Okay, I might have been wearing a blindfold at the Idea Festival's Lights Out Dinner last week, but I wasn't blind to the possibilities it and those to come provide for parody or outright dismissal--dilettantes dining on delectables in the dark while the real world grapples with issues like the UN's warning of a coming "silent tsunami" of hunger. Worse, they open the Idea Festival up to charges of staging events that are about little more than the novelty they offer. What, really, is the point of playing with our food? Whenever I was asked, in the weeks leading up to the Idea Festival's Lights Out Dinner at Louisville's Asiatique, I said the purpose for a dinner with blindfolded participants was to heighten their powers to taste, smell and feel, and to learn, collectively, how we would respond to those newly sharpened powers in the presence of really good food. It was an experiment with voluntary blindness as much as it was an invitation to let the other senses take center stage for a while. Sounds more than a little esoteric, in hindsight. Or at least shortsighted.